Richard Padbury, Lucideon looks at high performance polymers with superhero properties – what’s available today and for the future. As the ageing population rises and healthcare costs spiral, the healthcare industry is under pressure to develop new devices that address increased incidence of chronic diseases and injuries while sustaining exceptional standards and properties – all at a reasonable cost. It used to be that materials conforming to the human body capable of withstanding extreme conditions were a thing of comic book super heroes. However, with the development of high performance polymers, materials that can withstand large impacts, radiation, harsh chemicals, extreme temperatures, stretch well beyond their original length and magically disappear, have become a reality. 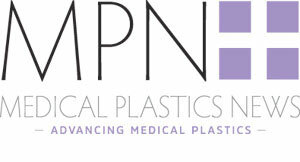 A range of conventional polymers have been used in medical devices for decades such as ultra high molecular weight polyethylene (UHMWPE) frequently used in hip and knee repair, polymethyl methacrylate (PMMA) for bone cements and polyethylene terephthalate (PET) widely used in vascular prostheses and sutures. A common definition of a high-performance polymer is a material whose properties such as strength, heat, and chemical resistance exceed those of conventional polymers. Of the different families and generations of polymers, polyether ether ketone (PEEK) certainly ticks every box due to its incredible properties such as high tensile strength (90 to 110 MPa) and melting temperature (>334°C (633 °F)) – over two and a half times higher than UHMWPE. Therefore, PEEK will stand up to the most demanding applications, repeated sterilisations and exposure to chemicals or drug formulations. Furthermore, PEEK’s biocompatibility, high lubricity and comparable properties to bone makes it a viable candidate for long-term implants that require high resistance to wear. Subsequently, PEEK is a superhero material that performs incredibly well in almost every application, if cost is not a problem. While PEEK is a well-known replacement for metals in a variety of engineering applications due to its light weight and attractive mechanical properties, it is easy to overlook other beneficial properties of polymers such as flexibility. Therefore, another class of polymer with superhero characteristics is thermoplastic elastomer (TPE) that provides exceptional toughness and extensibility. TPEs are copolymers of two or more monomers providing both thermally stable crystalline segments interspersed with flexible amorphous regions creating an elastomeric or rubbery characteristic. They can be easily melt processed in standard equipment and their physical or chemical properties can be tailored by varying the ratio of monomers or molecular linkages such as amide, ester, olefinic, styrenic or urethane building blocks. Therefore, TPEs can be used for a range of applications from catheters and surgical instruments to medical bags and tubing. So far, we have introduced high strength materials and polymers with exceptional extensibility which can fulfil a range of medical device applications. However, perhaps one of the most inspiring developments branches from the arrival of synthetic bioresorbable polymers. These polymers provide support to damaged or blocked tissues while slowly degrading over time allowing the body to restore normal function. Common bioresorbable polymers include poly(l -lactide), poly(glycolide), polycaprolactone and their respective blends or copolymers which are all well known for their biocompatibility. Subsequently, these materials degrade via hydrolysis upon contact with water in surrounding tissues. Commercially available biodegradable polymers are used for a variety of medical devices such as sutures, tissue staples, stents and drug-delivery devices as well as being candidate materials for scaffolds in the exciting, expanding field of tissue engineering. The materials introduced signify an evolutionary trend in the use of polymers for medical devices. While the first generation of medical polymers such as UHMWPE, PMMA and PET were designed to be inert and minimise the threat of an immune response, the second generation of medical polymers were designed to be biocompatible or bioresorbable. Nowadays, there is growing interest in materials that stimulate a specific cellular response namely, third generation biomedical materials. It is important to note that first and second generation materials can support the development of third generation biomaterials by promoting cell adhesion and growth through immobilisation of proteins or incorporation of bioactive compounds. For example, to improve the biological activity of PEEK, researchers are exploring the incorporation of bioactive particles such as hydroxyapatite (HA) onto the surface of implants to accelerate bone regrowth and improve attachment between the implant and surrounding bone tissue. Furthermore, HA has have been incorporated into super elastic polycaprolactone or poly(lactic-co-glycolic acid) bioresorbable polymers for tissue scaffolds that support cell viability and proliferation. These are the next generation of biomaterials with superhero properties due to their ability to enhance human health and wellbeing. As a polymer scientist, I am continuously fascinated by the diverse range of polymers that can be produced from blends, copolymers or synthesised from entirely new chemistries. It is completely reasonable that material selection for a specific application can be one of the most daunting tasks encountered by medical device designers and engineers. There are seemingly limitless options to choose from as each polymer is part of a large ancestry of subtle changes in molecular make-up that creates notable variations to their macroscopic properties. So where should I start? Primarily, material selection requires a basic understanding of polymer characteristics and how certain chemistries and morphologies influence their inherent properties. Polymers are characteristically different from their ceramic and metallic alternatives because of the long polymer chains that make up their unique structures. These long polymer chains are typically arranged in an entwined, random order similar to the state in which you find your Christmas lights at the start of the holiday season. However, domains of ordered, adjacent chains packed tightly together in a repeating pattern may also form resulting in polymers with semi-crystalline morphologies. As such, polymers are viscoelastic materials with distinct time dependencies, melting points and transition points which determine whether the polymer acts like a flexible, rubbery material or a brittle glass. Ultimately, it is a polymer’s unique chemistry that separates it from the diverse range of alternative polymers. So, which polymer should you use? The choice of material is closely connected to the properties required for the given application. Therefore, it is essential to create a comprehensive list of requirements for the medical device that underpin key constraints such as regulatory restrictions, operational use and mechanical properties. Perhaps one of the most crucial considerations for a medical device is whether the polymer needs to be biocompatible. Clearly, if the polymer is going to be in contact with tissue or fluids inside the body for long periods of time, exposure to potential process contaminants, residues, leachables and degradation products must be evaluated. Finally, the mechanical properties, dimensions and lifetime requirements of the device will have a substantial influence on the range of polymers suitable to achieve the required specifications. Selecting a polymer material based on these factors will be determined by traditional characteristics such as strength, stiffness or impact resistance as well as sorption, temperature deflection properties and chemical resistance which are required for a variety of climate conditions, including during transportation and storage. While polymer structure and chemistry impact their material properties, it is also important to consider how manufacturing processes influence stability. There is a range of manufacturing techniques available for medical polymers such as injection moulding, blow moulding and fibre formation. However, polymer structure and process conditions are intimately connected – polymer structure influences the process parameters needed to construct the material into a useful form, and process conditions can alter polymer structure to either enhance their properties or less conveniently, adversely affect them. Polymer processing is an art form, with an array of controls that need to be tuned to the inherent properties of the polymer material and the final requirements of the medical device.